According to the Mekong River Commission website (www.mrcmekong.org), the Mekong River is the tenth largest in the world and flows approximately 4,909 km. through China, Myanmar, Lao, Thailand, Cambodia and Vietnam. This magnificent river is the inspiration of our recently concluded ASEAN trip that traversed three countries, four cities and approximately 1,158 km., with new found friends and hopefully longtime travel buddies. It all started with a post or invitation by Mervin Meruenas at the group page of Guys4Mountains, where I am an honorary member. Seeing that a lot of my friends from Guys4Mountains were interested, I signified my interest also and when they started booking flights from Manila to Ho Chi Minh and Bangkok to Manila, I followed. Of course, there were some apprehensions but I have friends also joining the trip so I thought it was okay (and it was). Mervin, having done this tour several times, organized the whole trip for us. By that I mean arranging land transfers, accommodations, restaurant reservations and everything else. All coordinations were done over facebook and he patiently answered all our inquiries. He even issued SMS tips and reminders, which included having small dollar bills ready, bringing photocopies of our passports, etc. What a nice guy! 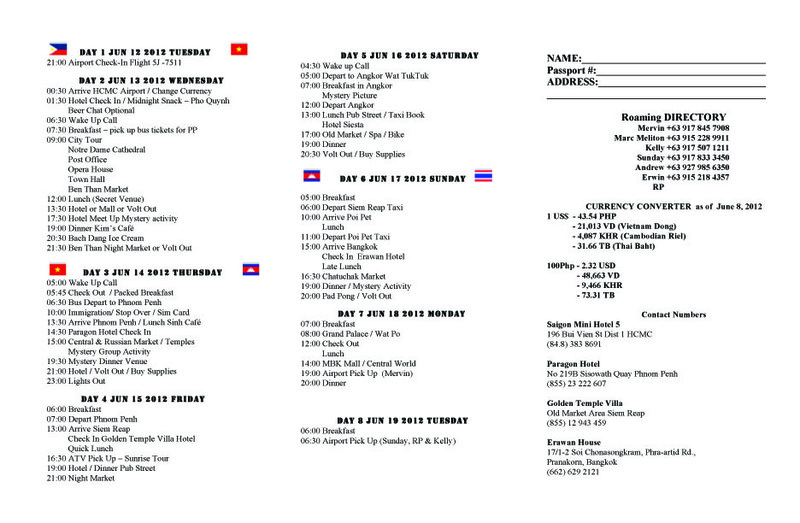 Weeks before a trip, he sent us this itinerary. He also computed for us our travel budget, which as mentioned in his initial invite didn't exceed US $300.00. We agreed to meet early at the airport. I was there by 8PM. Since I had dinner already at one of my favorite sandwich places in Shang and so as not to tempted to eat again, I decided to just wait for them at the boarding area. They all had pizza at Shakey's. We all took the midnight Cebu Pacific Manila - Ho Chi Minh flight, which left the airport on time with all of us. Thank God! Ho Chi Minh City, here we come! We started our great Mekong Adventure with a tour of Ho Chi Minh City (formerly Saigon). The only way to start this is with a bowl of pho. As soon as we checked in at our home for two nights, the Saigon Mini Hotel (196 Bui Vien St., District 1), we walked to Pho QUYNH at Pham Ngu Lao for pho. It was around 2 in the morning and that bowl was perfect to calm me down for a good night sleep. We needed that because we only had a few hours to snooze before we started exploring Saigon. We started our day early the following day (or after a few hours of sleep). After breakfast at the hotel where I had scrambled eggs, bread and Laughing Cow cheese, which is very popular in there in Vietnam, we met up at the hotel lobby to start our walking tour. First order of business was to get our bus tickets from Vietnam to Cambodia. We went to Sinh Tourist (De Tham St. District 1) to book our bus tickets from Ho Chi Minh to Phnom Penh (USD 10.00) and from Phnom Penh to Siem Reap (USD 7.00). From the travel agency, we walked to Ben Thanh Market, one of the Ho Chi Minh's popular landmarks, for souvenir shopping. Yes, that early. I really didn't plan on buying too much here in Ho Chi Minh because we still have 7 more days in our itinerary and two borders to cross. The market has souvenirs, local handicrafts, food and other interesting stuffs. Really mulled on buying these as souvenirs but too afraid that glasses might break. I ended up buying only refrigerator magnets and shoe bags. A few minutes walk from the market is the Ho Chi Minh City Hall, for another souvenir picture taking in front of one of the city's symbols. The building is not really open for tourists so we just took shot of the french colonial facade and of the statue of its namesake built at the small park in front of it. Next on our travel plan was the Opera House, another example of french colonial architecture in Vietnam. We walked to the Saigon Notre-Dame Basilica after, to whisper a little prayer of thanks and also to admire another Ho Chi Minh landmark. This is officially the Basilica of Our Lady of the Immaculate Conception. Next to the cathedral is the Saigon Central Post Office. This gothic architectural style landmark was built by Gustave Eiffel, whose most famous work is the Eiffel Tower (which I had the chance to see in 1997). Inside is more magnificent and I instantly wished that our post office here in Manila also develop into a tourist landmark. Souvenir items inside are nicer and cheaper. After that half a day walk in the city, lunch was in order and though this is not something I would do while traveling in the Philippines, I thought it was cool to do in Vietnam. We went to Jollibee for lunch and that for me meant two pieces Chicken Joy, which they served with red sauce, not gravy like here in the Philippines. After lunch, we hailed a cab, which took us to a popular shopping destination here in Ho Chi Minh City, the Saigon Square. There are two Saigon Squares here and this one is bigger. This mall is filled with original and fake items, including clothes, backpacks and other items. Yes, there are a lot of TNFs here, Millets and other favorite outdoor products. Cooling down with Kem Bach Dang Ice Cream! After shopping, we needed to cool down so we went to Kem Bach Dang Ice Cream, which is located at the corner near Saigon Square. Ice cream was delicious. I had a coffee flavored ice cream. BTW, as soon as you sit, waiters serve dumplings and wet wipes. These are not free. We met up again at the hotel after. Some went for a massage, we decided to explore the other Saigon Square. Dinner was at Kim Cafe (De Tham St. District 1), and this feast for 7 hungry tourists was only USD 34.00. Not bad. I particularly liked the vegetarian fried rice. What we were not able to do much here at Ho Chi Minh was enjoy the street food. I am a fan of fried rice and street food, so I can live here. Maybe in the future or in another lifetime. That was a recap of our the first leg of our adventure. Up next is Phnom Penh!